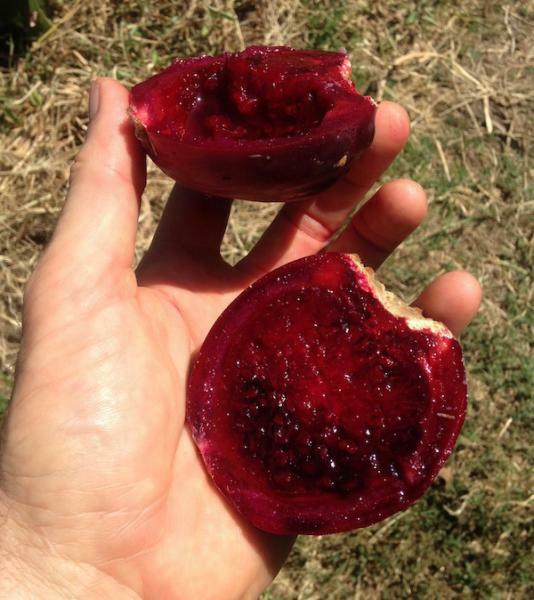 Deep red Prickly Pear fruit, from plants growing in Poway. This is not a native Opuntia, this is an Opuntia ficus-indica sort. This is a round fruited form, with round leaves/pads. Fruit has soft juicy flesh, juicier than typical prickly pear fruits for fresh eating, which is mildly sweet, with more tanginess/acidity(but not 'too much') than typical prickly pear fruit varieties used for fresh eating. Pleasant, refreshing eating quality. Spines/glochids should be taken off the fruit, by rubbing in grass or dirt, or rubbing them off with rubber gloves, as with all Prickly Pear fruits.